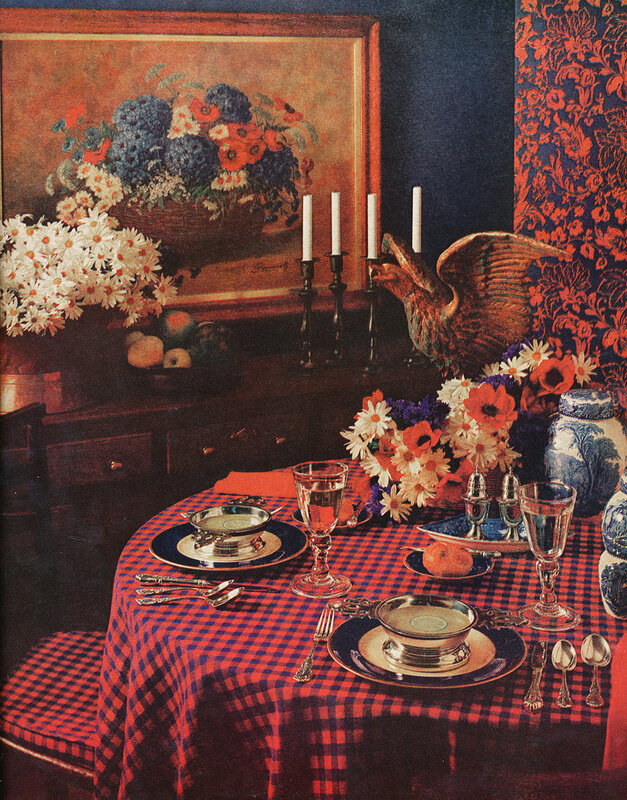 "Beauty queen in a national table-setting contest, this stunning table was judged 'best dressed.' Yes, despite its proud title, it is one that could be copied at no budget-breaking cost. The rosy colors of cloth and napkins are reflected in plump berries, massed among artichokes (use apples and eggplants in the fall), and the painted lantern. Wood-toned china, sparkling silver and crystal make an effective contrast." "They should be bright as a bouquet, dramatic as a summer theater, romantic as a sky filled with stars. Ans we support our belief with some of the gayest, prettiest tables you've ever seen! They'll make the simplest luncheon a gala affair and give a friendly glow to even the most formal buffet. If you have a terrace, a patio, a garden, put your next party outdoors. 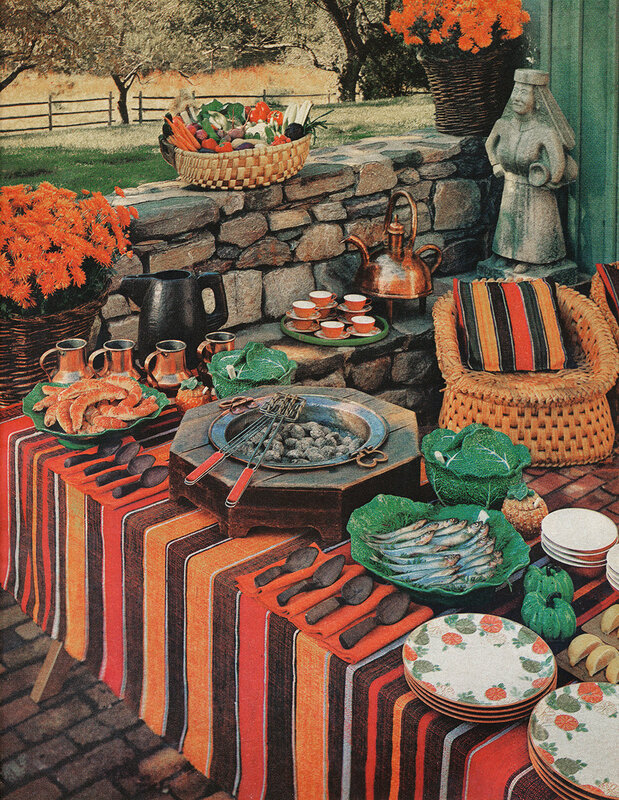 And if you haven't—well, any one of our tables will bring the outdoors in. Light it with lots of candles to flicker in the breeze; heap it with flowers; if you haven't any flowers, use vegetables, or whatever else is plentiful and in season. Of course, use your best china and silver, your most interesting accessories and linen. A successful table should reflect the personality of your home—informal, traditional, or in between. Don't be afraid to follow your own fancies. Or experiment boldly with ours. But, in any case, leave timidity to the faint-of-heart!" 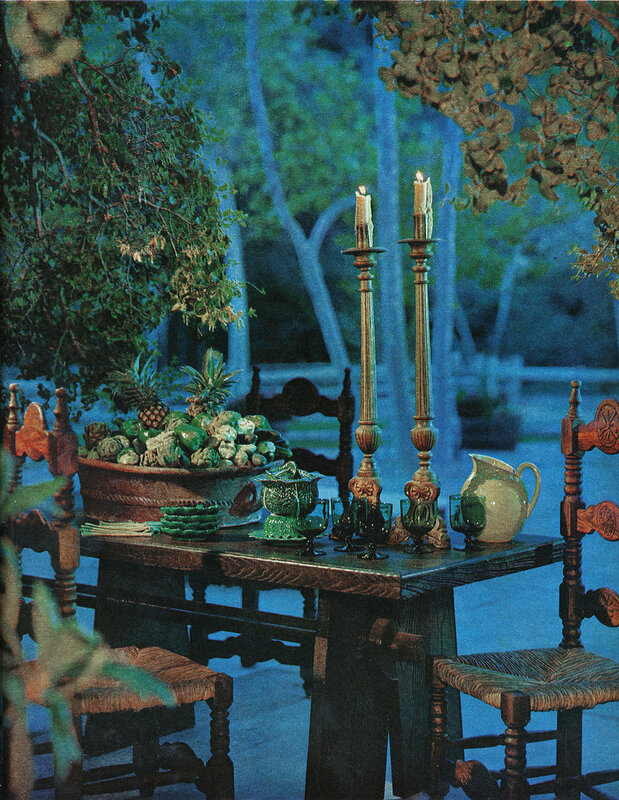 "California casual, with Spanish and Mexican overtones, this table of heavy oak is set on a moonlit patio. Handsome, impressively massive, it gives a certain rugged dignity to the green majolica, low-footed glasses, informal yellow pitcher, and huge pottery tub crowded with pineapples, avocados, summer squash, and squat, shiny bell peppers. The tall chairs, the towering candlesticks add a seigniorial quality." "Here are two sharply contrasting tables with a common denominator of charm. The peasant table reflects the owner's visit to Portugal: Pottery, statue, olive-wood pitcher and serving spoons, all are Portuguese; tablecloth and pillows are made of a heavy, handwoven fabric that is sometimes used for rugs; copper pieces show a Moorish influence. The melamine plates, however, are made in this country." "And here's a full-dress buffet for a wedding reception, or another occasion of equal importance. Starting with the ribbon-banded cloth, no detail is overlooked: the most formal silver, china, and crystal; the opulent elegance of silver chafing dish and casserole; stately bronze candelabra. An eighteenth-century bouquet of yellow roses, snap-dragons, and freesias adds brilliant emphasis to the color scheme." "French to its very fingernails, this dainty table could be one of several others, almost identically dressed, if your room is ample; or it could solo in a tiny dining alcove. 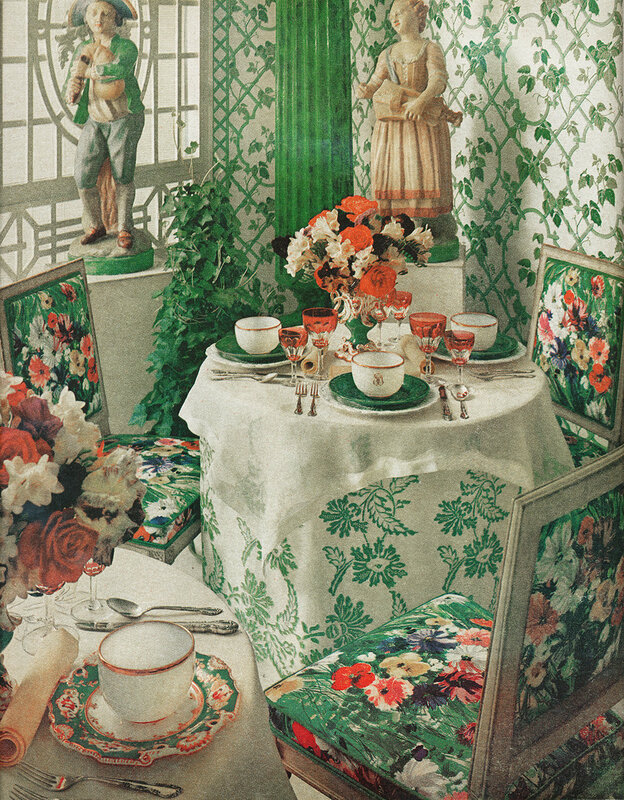 The garden look started with the ivied wallpaper, spread to the potted ivy, the field-flowered chairs; the embroidered table skirt; the floral border on Worcester plates; and finally the radiant flowers in the Coalbrookdale porcelain vases." "Of course, you've noticed the pretty thievery: The floral centerpiece is stolen from the painting above the buffet. You could also lift a pattern from your wallpaper, your draperies, your china. A table like this is as American as the Fourth of July—which immediately suggests an occasion for it. However, such a setting in red, white, and blue is so festive that it makes its own holiday, no matter what the calendar."